We love science at Echo. It has been my greatest pleasure to share the science about the impact of trauma, including the changes that happen to the various systems of the body in our Trauma and Resilience trainings. The list is pretty exhaustive, and to try to make sense of it all, we’ve developed another of our popular infographics. Nervous system: This is where we focus a lot of our attention in trauma and recovery. The nervous system takes a beating when we live with toxic stress or trauma over a long period. Nervous system ‘hacks’ such as deep breathing can also be a really good way to interrupt the physical and emotional response to trauma that may continue to live in our body long after the trauma is past. Immune system: The high level of cortisol (stress hormone) that trauma produces at first suppresses the immune response. After a while, the tissue becomes resistant to cortisol and it no longer has a dampening effect. This is when our immune response goes haywire, creating inflammation, which is at the root of so many autoimmune diseases. Cellular change: Trauma changes the way that the genetic information in our cells is read and transcribed, creating a cellular level change in response to trauma that can be carried down to our children. Neurotransmitters: Apart from the obvious reasons someone might want to use drugs or alcohol to escape the psychological impact of trauma, trauma can also have an effect on our neurotransmitters, which makes us more susceptible to addition. It also impacts serotonin production, which leads to depression. Brain architecture: Perhaps the most fascinating aspect of learning about trauma is understanding how it impacts our brain – as well as how ‘neuroplasticity’ allows new brain cells to grow and restore damaged areas. Come to our Trauma & Resiliency training and you will amaze your friends and relatives with your fluency in terms such as amygdala, hippocampus, and prefrontal cortex! Neural pathways: Ever feel like your thinking is like a well-worn groove in a record and that the needle keeps drifting into it and getting stuck? Well, that’s exactly what is happening. The brain cells connect into neural pathways that become stronger the more often they get fired. Changing your mindset is like changing habits – it takes a lot of practice and will feel really unfamiliar at first. Hormones: The stress hormone cortisol features large in the trauma story, just as oxytocin (the ‘love’ hormone) features large in restoring our bodies to a place of rest and balance. But other hormones are affected by trauma too, including the thyroid hormones. 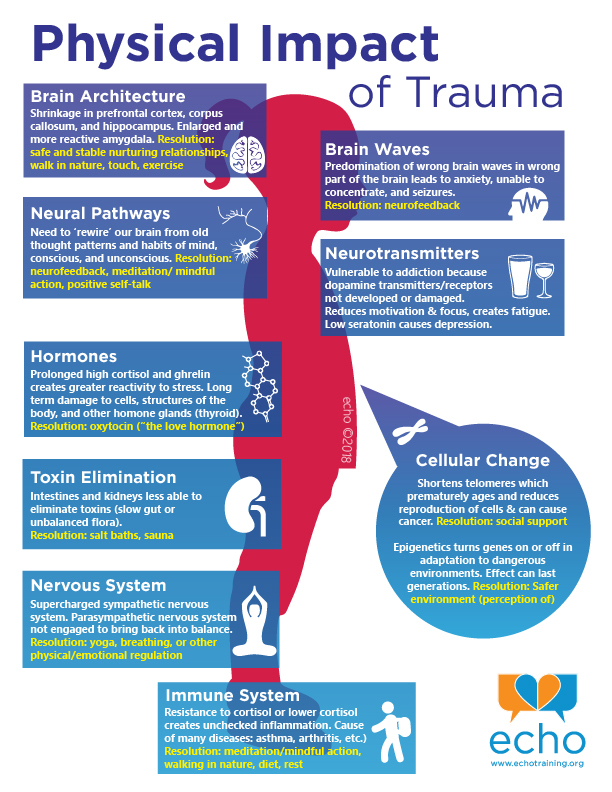 This is just a brief overview of the myriad effects of trauma on our physical bodies. We also talk in more depth at our trainings about how to reverse these effects. I hope you like the infographic and are inspired to come and learn at our Annual Conference in March (special discount code for ACESConnection members aces315) or our Trauma & Resiliency trainings in January!